Gambling is considered a great form of leisure time for a lot of people. The excitement that one feels while playing is indescribable. In addition to that, the stakes involved spice up the experience a whole lot more. But for some folks, going to the casino every now and then can be a difficult task since it requires a lot of time and effort considering their very busy schedule. That is why over the years, a lot of online casinos and gambling websites are popping up at an increasing rate to cater customers who want to play inside the comfort of their homes or while they take a break at work. Today, Titanbet proudly brings you an app that’s just perfect for the job. The Titanbet app for Android is very similar to its website counterpart. You are still given the same advantage of accessing its promotions, bonuses, markets, services, payment methods, banking options, etc. The layout and design of the app were given much thought by its creators as it is elegant yet simple enough for even the first-timers on the app to navigate through. It’s an online betting app you surely don’t want to miss. Titanbet is well-known for its amazing features and promotions and this app is a successful high-quality mini-version of it. There are a lot of valid reasons why people would choose this online betting app. First off, using the app doesn’t provide much of a struggle for its first-timers and users, since the design makes the navigation very easy and well-organised. You also get to see a wealth of sports markets that are efficiently arranged in alphabetical order. You can scroll to the very bottom of the page to check your favourite sports event or navigate through the tabs. You can also click on the banner found on the top portion to switch from sports to another market of your liking. 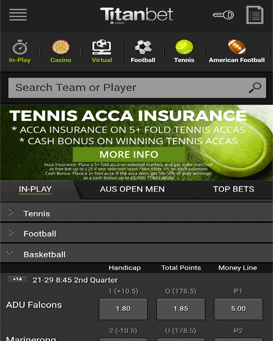 Once you log in to the app, you’re instantly presented with its in-play betting feature. Another cool thing about the app is that you can bet on what’s currently trending. You just have to click on the ‘trends’ tab and see the top 5 bets of your fellow punters. The app also offers live streaming of horse racing so that you won’t miss out on the latest happenings of the event. It also helps you win at greater odds since you can be able to decide whom you should place your bet on carefully. The app also offers the Fold Acca Insurance, which hosts various offers and helps you use your money to the fullest. This could help you take home bigger prizes and winnings. There’s no doubt why Titanbet is one of the best betting apps found on the European market. Downloading the app is pretty easy. The first thing you have to do is go directly to its main website www.Titanbet.com/mobile and register. Once you’ve registered, you’ll get a £25 worth matched bet for free and the entire process would only take you a few minutes. To be able to download the app, you first have to allow it to be installed on your device. To be able to do that, click on settings, look for the security option and then mark “allow for unknown sources”. Now in order to download the app, go to the Titanbet website on your phone’s browser. Once you have loaded up the site, you should find the Titanbet APK pop at the bottom of the page. Wait for the file to download’. Pull down the menu and click on it. Wait for the app to launch. After you’ve accomplished all the steps mentioned, you can now log in to the site and check out the great opportunities waiting for you. If you’re an iPhone or iPad user and want to download the app, do not worry any further since this amazing app is also found in iOS devices as well. The Titanbet app for iPhone and iPad also allows you to receive the same wide range of promotions and features so you wouldn’t have to miss out on such a fun and exciting experience proudly provided to you by the app. The design is also the same, which has cool black tones and a simple layout so your eyes wouldn’t hurt when you find yourself on the app for a while. It’s also so easy and safe to use on your device. You don’t have to look anywhere else for such a reliable on-the-go betting app as Titanbet is just the right thing any betting connoisseur would need. Another great advantage of having this app on iOS is that it is effortless for those who are interested in finding and using the app. You don’t have to go to your mobile’s web browser but instead, look for the app on iTunes. After a few taps – voila! You can now join the fun and experience the ultimate betting app that is Titanbet. For iPad users, you can enjoy the app at a different level. With a wider screen, you can get a full view of the site which makes the app more comfortable and more efficient to use. The features that you would find on the iOS app are similar to its Android and desktop counterpart. You get the same amount and variety of betting options, access to different sports events, play casino, get cool bonuses and promotions. This app is just what you need if you want something that gives you a considerable variety when it comes to choosing markets. You’ll also get to enjoy tons of bonuses and other offers. There are not really a lot of steps to follow if you want the Titanbet app on your mobile device. Players using Apple products such as iPhone and iPad can get the app easily on the iTunes. You can easily download the app in two ways. You can either look the app up on iTunes or download it directly from its website www.Titanbet.com/mobile. Click on the ‘install’ option. Fill in all the needed information during the registration process. After a few taps, you can now join betting in different sports tournaments, play casino, poker and even bingo. You could also make use of the site in your mobile browser. It runs as smoothly as the applications that you may find on its Android and iOS versions. The great thing about using this version is that there’s no need to install the app. The only thing that you would have to do is to register on its main website and sign in afterwards. The entire process is quick and hassle-free. The design is similar to what you would see on Titanbet’s website which is clean, well-organised with a great line-up of playing options. Once you’re a member, you can utilise the many great offers that are given to you by the site. You can also make use of the same payment methods, marks, promotions, and bonuses. Another great thing about the mobile site version is that it allows you to play up to about 100+ games in comparison to the apps. So if you want a long list of options, it’s better to make use of this version. Titanbet’s mobile casino app is a huge site among fellow punters and betting fans in the United Kingdom. With its debut last in 2014, it received great reviews from the community for its extensive list of awesome games. It offers both slots and table games. You can play mobile versions of Baccarat, Blackjack, European Roulette, 3 Card Brag, Blackjack Switch, Jacks or Better, or Asian games if you want to play something new, yet as funny and exciting as Wu Long, Zhao Cai Jin Bao, and Fei Cui Ging Zhu. The graphics are also pretty sleek and well-designed. The casino app is a really great innovation by Titanbet as it lets users play and choose up to 40 games having more to add in the future. What Features are Incorporated in the Apps and the Mobile Version? The features that are being offered by both the app and mobile versions are quite similar when it comes to the layout, bonuses, payment methods and some of the games offered. You can enjoy the Acca Insurance which was mentioned earlier. It gives players a huge advantage on any sport as it covers 4 folds. If you also bet on the app regularly, you’ll get to receive more bonuses and other promos. There’s also a free welcome bonus for newcomers of the app. It’s also highly encouraged to use the Titanbet on a fast internet connection for you to be able to load your markets faster and place bets right away or on time. What’s amazing about this brand is a number of great bonuses and promotions Titanbet offers to its customers. If you decide to play casino games or poker for the first time, you can claim a 100% deposit bonus on casino games and a 200% deposit bonus for poker if you make at least a £20 deposit. But if you don’t get a winning streak from playing card and table games or slots at your first time at Titanbet, they will give you up to 50% refund that can reach £200. Isn’t that a good deal? For horse racing, you can make use of the 10% multiples bonus. There’s also another bonus especially on Wednesdays wherein you can get a certain percentage of the losses that you’ve made for the last 7 days that worth over £10. The refund could cover up to an amount of £250. The Titanbet is as exciting as it is going to get. As of this moment, the Titanbet app does not support Windows and Blackberry. You will need to have iOS 7 or its later versions and for Android, you need 3.0 or higher. Examples of iOS devices that are compatible are iPhone 5S, iPhone 5C, iPhone 5, 4th Generation iPad, iPhone 4 and 4s. For Android devices, you can use Lenovo U1, Acer 5”, Asus Eee Pad EP121 and Samsung Galaxy S2 I9200. Titanbet offers its customers different payment methods so that it would be straightforward for them to make a deposit or withdraw. Making a deposit is pretty easy. Just click on ‘My Account’ tab and go to ‘Cashier’. Choose the payment method you want and type in the amount of money you would want to deposit. It takes only a few minutes, and the cash is transferred immediately. If you want to withdraw your cash, you can repeat the same process mentioned earlier. Just be sure to click on the ‘Withdrawal’ option from the page. The processing period may only take you a minute but could also take up to three business days at most. The minimum amount to deposit can vary from 10 Euros to 100 Euros, depending on the payment option used. There’s also what the site calls a ‘Deposit Limit’ facility wherein you can place a cap on how much money you can deposit into your account. You can increase the limits or lower it down, depending on your preference. Titanbet, a well-established online casino in the United Kingdom, has now created an online betting app version of its website. Titanbet is an iGaming provider that started in 2004 with Titan Poker. Now, it also offers bingo, casino, and sports betting. All of these are connected by Playtech’s Information Management System (IMS). The online gambling company works under the Antigua and Barbuda laws and is regulated by the UK Gambling Commission and the Offshore Gaming of Antigua and Barbuda. The app proudly offers a lot of exciting great features and promotions. You can also have access to a wide variety of betting options including sports, poker, bingo, and casino. Plus it has a cool simple design that makes your experience on the app enjoyable and all the more worthwhile. It has more than 400 games and provides instant play options. You can read our in-depth review of Titanbet where you will find information about the bookmaker, it’s payment methods, betting markets and sign-up offers. This time we will review the mobile app, and it’s main features. How do I access the website on my mobile device? Go to your mobile browser and type in https://i.titanbet.co.uk/. How do I register an account on Titanbet mobile? The registration can only be done through its online registration page. Go to the main website and click on ‘Join Now’ or you can click on this link. What devices are compatible with Titanbet mobile? You can open and use Titanbet through iOS devices such as iPhone and iPad and all Android devices. What are the languages available in Titanbet mobile? As of the moment, the website is only available in English. Do I need to make another account to play the app’s mobile casino? No. You can use the same account for all Titanbet versions. What are the bets available in Titanbet mobile? The bets available on the website are all found on Titanbet mobile. How can I live stream using Titanbet mobile? You can live stream horse races using the Bet and Watch feature. For you to use the feature, bet £1 on any UK or Irish horse race. Overall, Titanbet rates 9 out of 10 stars. It has the necessary features needed for an online betting app. It has a great range of sports to choose from, generous promos, and a simple design for prolonged use of the app. One of the many great features about Titanbet is that it rewards you for your loyalty with its generous loyalty bonus. It’s definitely the perfect bookmark with its virtual racing and extensive betting options for you to play wherever and whenever. It’s a brilliant companion for any punter that’s always on the go.